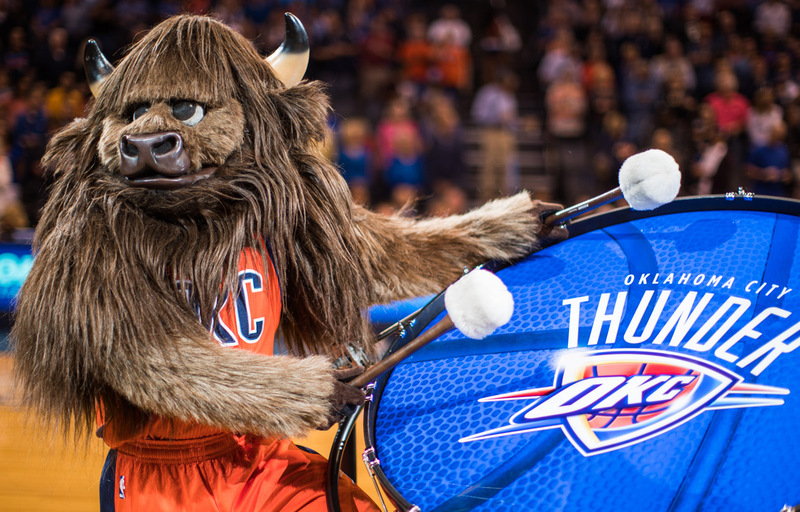 Download the Rumble the Bison coloring page. INVITE RUMBLE TO YOUR EVENT! Birthday Parties, Business Meetings, Holiday Deliveries, Conventions, School Assemblies, Grand Openings and Company Picnics! Rumble does it all. For more information, call: 405.208.4800. 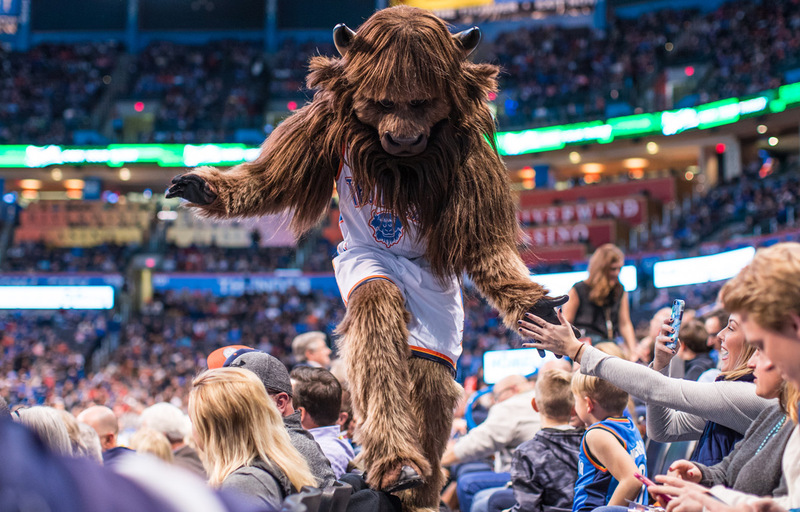 See photos of Rumble in action at the Chesapeake Energy Arena, in the Community and at your event! For hundreds of years the tale has been told around Native American campfires. A great herd of American bison was lost in the Arbuckle Mountains during a ferocious storm - the kind only Oklahoma can produce. Hail fell and tornadoes spun all around the herd as they stampeded, trying to find their way down to the safety of the plains. One lone bison stayed behind as he helped each of his friends escape down a treacherous ravine...once all of his friends were safe he began his descent only to find his way blocked by fallen boulders. Lost, he climbed to the tallest peak; left to face the storm alone and searching for a way down the mountain, he was struck by a bolt of lightning. The bolt did not destroy him, but, by the power of the god of thunder, changed him. Suddenly, he walked on two legs like a man. He possessed amazing strength and agility - he could jump higher, run faster, think more clearly than any beast. But because he was no longer just a bison - and yet not a man - he was alone. With many sightings, the legend grew through the years, of a mighty bison, with remarkable powers, roaming the hills alone. 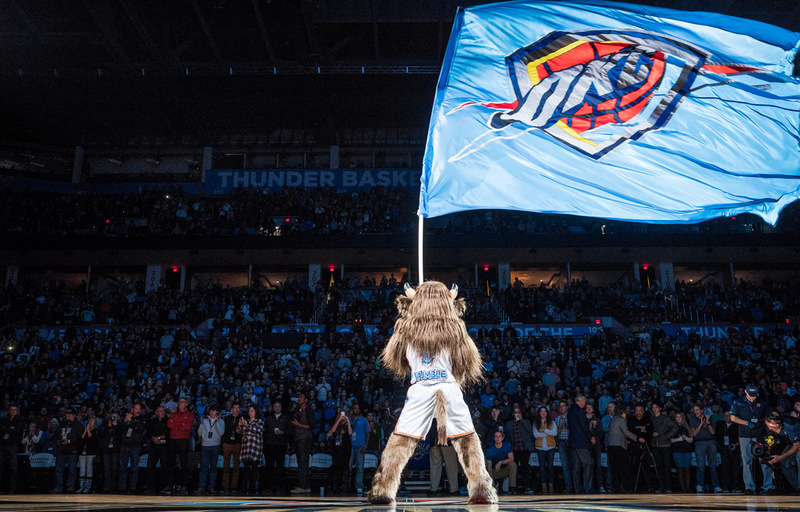 Not until a group of men who carried similar powers came to Oklahoma City did he find somewhere he belonged. These men also possessed the power to jump higher, run faster, and perform acrobatic dunks more spectacular than anyone in the land. They too carried the roar of Thunder every time they took to the court. So he joined their team. And the new legend of Rumble was born.